There he achieved his first major success: the DH-4, a two-seat bomber that first flew in August 1916. Highly manoeuvrable and with a top speed of 143 miles per hour (230 kilometres per hour), it could outfly most fighters. In 1917, when the United States entered the war, officials in Washington selected it for production and built nearly 5,000 of them. DH-4s carried the early U.S. airmail; some also carried passengers. They remained in service through the 1920s. The DH.82A training biplane was designed by Capt Geoffrey de Havilland during 1931 as an improved derivative of the DH.60 Gipsy Moth. Two DH.60T De Havilland Tiger Moth prototypes tested late summer 1931 with 120 hp Gipsy III inverted in-line engine, followed by first DH.82 with increased dihedral and sweep-back flown on October 26, 1931. Entered production for RAE as new standard ab initio trainer (as noted below); pre-war production of DH.82s by de Havilland at Hatfield also included five for Danish Air Force and 20 for Persian Air Force. 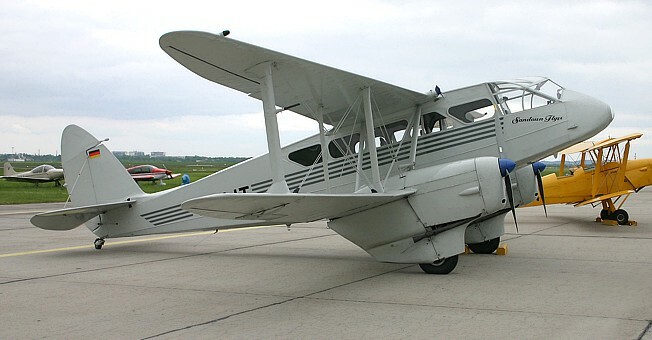 In 1934, DH.82A version introduced 130 hp Gipsy Major, plywood rear fuselage decking and blind flying hood over rear cockpit. Pre-war deliveries, apart from (or by diversion from) RAF contracts, included nine for Danish Air Force, 59 for Persian Air Force, 17 for Iraqi Air Force, 12 for Brazilian Air Force, one for RCAF, 110 for RNZAF and 20 for RAAF. DH.82As against RNZAF contracts between 1940 and 1944. 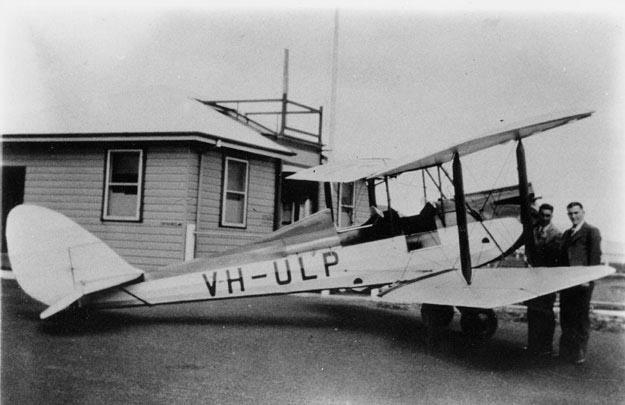 De Havilland Aircraft Pty Ltd in Australia built 1,085 DH.82As between 1939 and 1945, of which 743 sup-plied to RAAF, 20 to RNZAF, 120 to South Africa, 94 to Southern Rhodesia and 128 to India. In Canada, de Havilland built 25 DH.82As for RCAF to add to one British-built specimen and then went on to produce the DH.82C variant noted below. Proposed production of 200 DH.82As in Bombay can-celled but at least 120 previously civil De Havilland Tiger Moths impressed for service in India 1940-42, of which a few converted as ambulances carrying one stretcher beneath hinged rear fuselage decking. Other impressments included 21 for the RAAF, 29 for the SAAF and 24 for the RNZAF, all from local sources. DH.82 De Havilland Tiger Moth I: Initial production batch of 35 for RAF to Specification 23/31, deliveries starting 1932. Also two seaplanes to Specification 6/33 for evaluation in 1932. 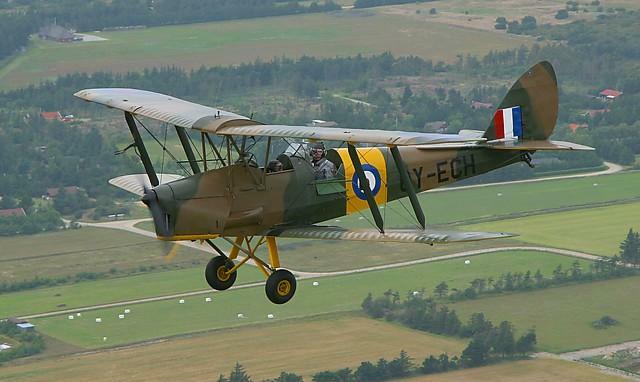 DH.82A De Havilland Tiger Moth II: Major production version to Specifications 26/33 and 7/35. Two delivered as seaplanes in 1936. Rear fuselage strakes added retrospectively 1942 as anti-spinning precaution. Equipped 28 Elementary Flying Training Schools in UK during World War II, and many exported to help equip RAF Empire Air Training Schools (in addition to Canadian production noted below). Adapted 1939-40 for use as emergency anti-invasion bomber carrying eight 20-lb (9.1 kg) bombs. Max speed, 104 mph (167 km/h). Cruising speed, 90 mph (145 km/h). Initial climb, 635 ft/min (3.23 m/sec). Service ceiling, 14,000 ft (4,267 m). Range, 300 miles (393 km). Empty weight, 1,115 Ib (506 kg). Gross weight, 1,825 Ib (829 kg). Span, 29 ft 4 in (8.94 m). Length, 23 ft 11 in (7.29 m). Wing area, 239 sqft (22.2m2). 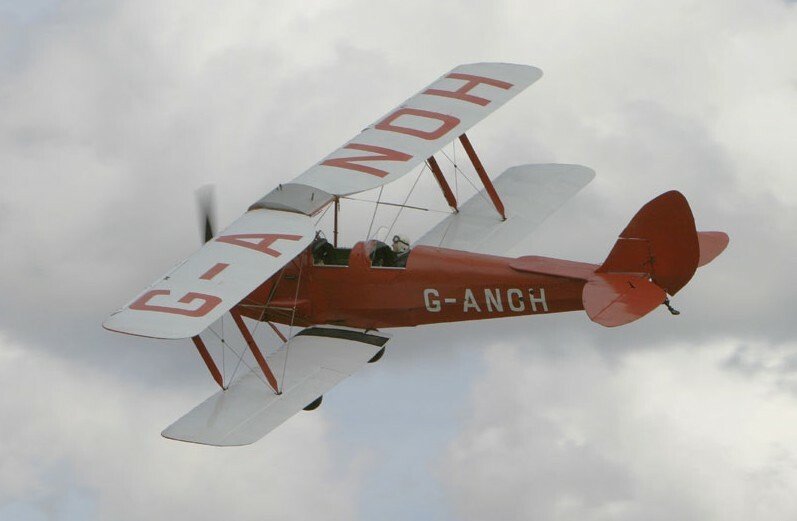 This version of the DH.82 Tiger Moth was designed to Specification 18/33 for a radio-controlled target aircraft, for anti-aircraft gunnery practice. Used DH.60-type wooden fuselage in place of D.K.82 metal-and-fabric type, with 130 hp Gipsy Major I engine, larger fuel tank in centre section and radio control gear in rear cockpit. Alternative wheel or float undercarriage; normally launched from ship catapult as a seaplane for use at coastal ranges, landing on the sea afterwards for recovery. Prototype first flown (manually) on January 5, 1935; 320 built by DH at Hatfield to Specification 20/35, deliveries starting in 1935, and 60 by Scottish Aviation at Glasgow in 1943-44. Operated by Anti-Aircraft Co-operation Unit Flights in UK and overseas. Max speed, 104 mph (167 km/h). Gross weight, 1,825 Ib (829 kg). Span, 29 ft 4 in (8.94 m). Length, 23 ft 11 in (7.29 m). 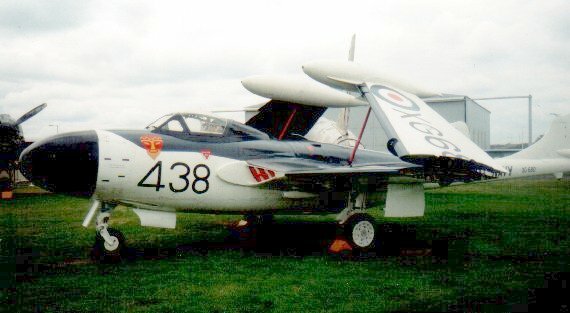 DeHavilland Vampire/Sea Venom - The De Havilland Vampire was Britain's second jet fighter, designed during 1942 to Specification E.6/41 around a single 2,700 Ib st (1,226 kgp) H-l Goblin turbojet, with an armament of four 20-mm Hispano cannon. 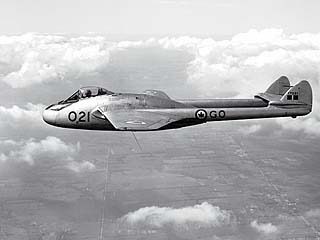 First of three De Havilland Vampire prototypes flown September 20, 1943, under code-name 'Spider Crab'. Production contracts placed with English Electric Co at Preston, for 120 on May 13, 1944, and 180 more on May 7, 1945; first production De Havilland Vampire F Mk I flown at Salmsbury April 20, 1945. Deliveries, initially to equip No 247 Sqn, began after end of war. Sold to DeHavilland on 26.11.53. To Indian AF as ID603 30.7.54. DeHavilland Dominie - The DH.89 was developed in 1933/34 as a light general purpose transport, the proto-type flying on April 17, 1934. Total of 728 built, including 206 as DH.89A Dragon Rapide up to 1939 and remainder as RAF Dominies, noted below, all with 200 hp Gipsy Queen III engines. Deliveries included two to RAF in 1938 for communications to Specification 21/38, three as R/T trainers to Specification T.29/38 and two as VIP transports, plus two to RAAF for communications. In 1939, 44 DH.89As assigned to NAC in UK, of which 14 operated in civil guise for internal communications through-out war; 43 ex-civil examples impressed for RAF use, including ambulance duties, ATA ferry service and Anti-Aircraft Co-Operation Units. About eight DH.89As impressed in India, plus four ex-RAF Dominies civil-registered for use by Air India and then also impressed. Seven civil DH.89As impressed in Australia for RAAF as radio/navigation trainers until 1944; six impressed for RNZAF, several for SAAF. A number of Dragon Rapides was operated during the war by the Luftwaffe. They included two ex-Latvian and two ex-Lithuanian aircraft originally captured by the Soviet forces, and then by the Luftwaffe. DH.89B Dominie: Production of DH.89s from 1939 onwards for military purposes; name Dominie adopted 1941, with Mk I for navigation and W/T training and Mk II for communications with six passengers and two crew. Production totals, 186 by DH at Hatfield and 336 by Brush Coachworks at Loughborough, to 1945. Some transferred to USAAF in Europe; nine to RNZAF, 18 to SAAF and others to Allied air forces for communications duties. Max speed, 157 mph (253 km/h). Cruising speed, 132 mph (212 km/h). Initial climb, 867 ftlmin (4.4 mlsec). Ceiling, 19,500 ft (5,944 m). Range, 578 mis (930 km). Empty weight, 3,276 Ib (1,487 kg). Gross weight, 5,500 Ib (2,497 kg). Span, 48 ft 0 in (14.63 m). Length, 34ft 6 in (10.52 m). Wing area, 336 sqft (31.2 m2). DeHavilland Chipmunk Developed just after World War II, the DHC-1 Chipmunk was the first aircraft designed by DeHavilland of Canada to replace the DeHavilland Tiger Moth as a single-engine basic trainer. The Chipmunk first flew on 22 May 1946. Initially, 218 Chipmunks were built for the Royal Canadian Air Force, followed, after a change to the Gipsy Major 8 engine, by 735 planes for the RAF’s primary pilot training bases. These were designated as T 10s. Engine: One 145-hp DeHavilland Gypsy Major 8 inline piston engine. Weight: Empty 1425 lbs., Max Takeoff 2014 lbs. The BBMF operate two aircraft serials WG486 and WK518. 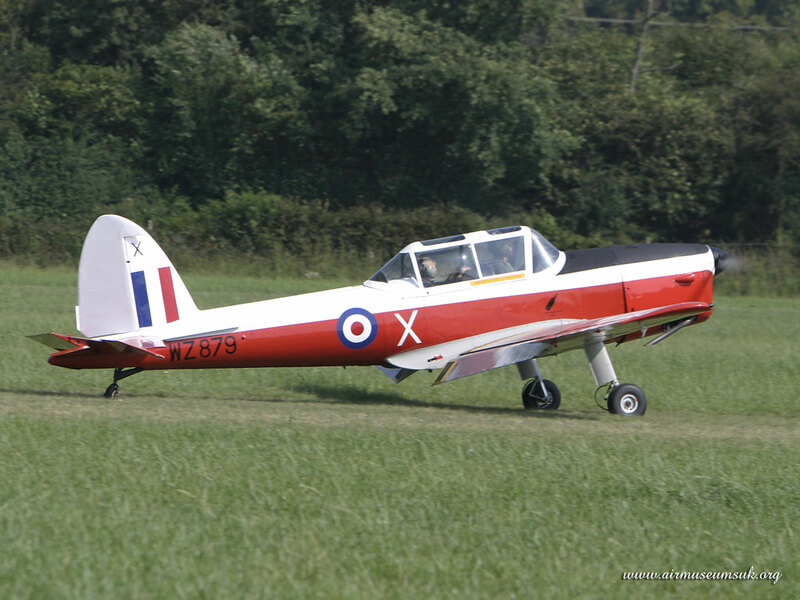 The two De Havilland Chipmunks held on charge by the BBMF are the last in RAF service and are probably the least-seen aircraft of the BBMF’s fleet. 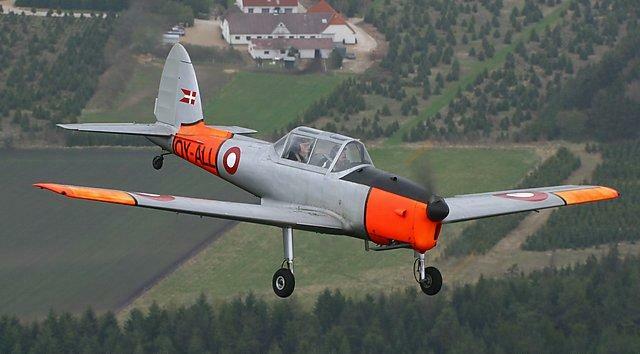 They are used year-round primarily for the conversion and continuation training of BBMF pilots on tail-wheel aircraft. Within the RAF, ‘tail-draggers’ are now unique to the BBMF and pilots new to the Flight commonly arrive with no previous tail-wheel aircraft experience. Other functions of the aircraft include the delivery of small spare parts, the delivery or collection of pilots and also the reconnaissance of new venues. 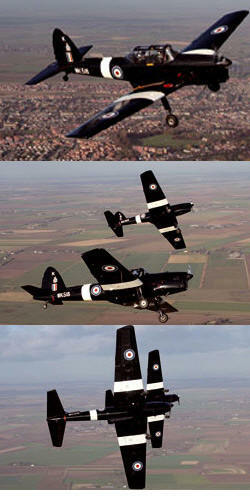 Both BBMF Chipmunks appear in a smart high-conspicuity black paint scheme with white bars. Of the two aircraft, WK518 has been with the BBMF the longest, having been delivered to the Flight from No 1 Air Experience Flight (AEF) in April 1983. The aircraft was first delivered to the RAF in January 1952 going to the RAF College at Cranwell. Other units who have operated WK518 include the University Air Squadrons (UASs) for Liverpool, Manchester, Cambridge, Hull, Leeds and London Universities, the Cottesmore Station Flight and No 1 AEF at Manston. WG486 was also delivered to the RAF in January 1952 and served with No 5 Basic Flying Training School, No 9 Refresher Flying School and No 2 Flying Training School (FTS) before being used by the Army with 651 and 657 Squadrons. 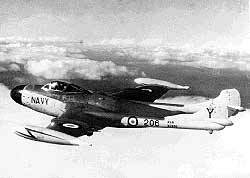 The aircraft was issued to the Middle East Air Force in 1958 with 114 Squadron before returning to the UK in 1961. It was subsequently operated by units that included the RAF College at Cranwell, Initial Training School at South Cerney and Church Fenton, No 1 FTS, PFS, Liverpool and Bristol UASs and No 3 AEF. In 1987 WG486 moved to Germany to operate as part of the Gatow Station Flight in Berlin, which was then surrounded by Communist Block territory. It therefore became the most unlikely ‘spy plane’ and ‘Cold War warrior’ until the Berlin Wall came down. When Gatow closed, the aircraft spent a year at Laarbruch before being delivered to the BBMF in 1995.